Thursday was my longest run for my marathon training. I can’t tell you how excited I am that it is over! It was kind of a tough run, because several thunderstorms were passing through that morning. I ran almost the entire thing in the pouring down rain, which I’ll admit isn’t all that terrible considering the heat we’ve been having, but the lightning kind of freaked me out. Can you imagine getting struck by lightning?!? There goes all that training!!!! So I found this underpass and ran circles underneath it every time I saw lightning nearby. It was a four hour run and that portion took up about an hour of my run=( UGH! Imagine running circles around your bedroom…that’s kind of what it was like. The sad part was that my watch couldn’t get a signal while I was in the underpass, so a good part of my run was not recorded. If you’ve ever done a long run, I know you understand my pain. After that experience, I thought I’d share my tips on how to survive the long run. 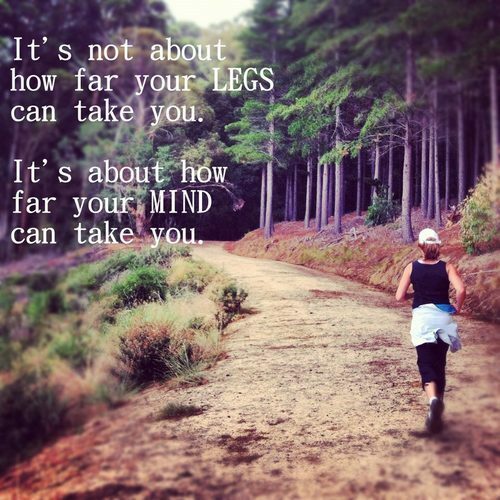 The long run may seem daunting to many, but it doesn’t have to be. While I don’t love having to get up at ridiculous hours, I do really enjoy the time now. You can find article after article about the advantages and disadvantages to both. When I trained for my first marathon, I did it without using headphones. This time around I used headphones. In fact, not only have I worn headphones, but I discovered the world of books on tape. And let me tell you, my long runs have flown by! PLEASE USE SAFELY!!! Be responsible with your volume-control and always, always be aware of your surroundings. Tip: Try using the headphones for only when you need it, rather than the entire time. It may be the extra push you need to get through. Running in a race or with a group of people is a great way to ensure you’re committed to the run. 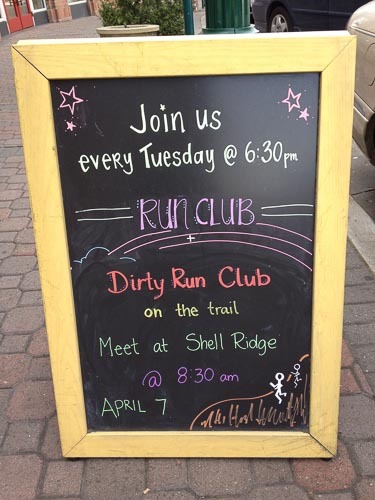 Head on over to your nearest running store and ask about local running groups. They have become so popular that even stores like Lululemon and Athleta have organized runs. Even better, join a race whenever possible. It will not only help push you through the long run, but it will give you race experience which can boost your confidence come big race day. One of the best things about the training program I use is that it breaks up the long run. So instead of running for two straight hours, it says run 75% and walk 25% during two hours. Broken into segments of my choosing, the two hours might look like: (run 18 minutes, then walk 6 minutes) x 5. I can easily wrap my head around the idea of running for 18 minutes. “Just get through 18 minutes,” I say. Or, “only 3 more runs to go.” Mentally it’s a heck of a lot easier and less scary to think of the run as parts rather than a full two hours. For you, maybe you break it up into distances, like run three miles, walk a half, etc. Whatever seems easier, try breaking up the run into smaller segments. Tip: If you can run loops (like circling your neighborhood), place water and snacks near the beginning of your loop (e.g. the front of your house) and you can easily take a water/snack break. If actually breaking up the run into running/walking segments isn’t possible for you based on your own training program, break it up mentally. One of the most important things to do during your long run is to fuel your body. Drinking water and consuming a snack of some sort (click here for ideas) will help prevent fatigue. I like energy gels, because they are transportable and easy to eat. I also love coconut water and electrolyte infused waters. And I usually snack during my running segment, rather than my walking segment because it’s yet another distraction. Sometimes just exploring a new path, trail, or neighborhood is all you need to get you through. Wake up a few minutes early if you need and drive over to a new part of town. Looking at my watch or focusing on the pain are the worst! So I move my focus to something else. If I get the urge to look down at my wrist, for example, I’ll focus on my breathing instead. Or I’ll run through a list of things I need to accomplish that day/week. I’ve come up with grocery lists, holiday ideas, plans with friends, composed emails in my head, and written full blog posts all while running. I’m often amazed at how much I can actually get done during a run! Running with friends is all the motivation I need to get me through a long run. Maybe a friend won’t run the entire distance, but maybe they’d run the last half or a few miles with you. My dear friend, Kathleen, ran the last 8 miles of a long run with me a couple years ago and it was perfect. We didn’t talk much, but just having her there was what helped get me through. Truth be told, I might have worn that anyway on Thursday, but toward the end of my run, I absolutely planned which pants I was going to wear and then imagined how cozy they’d feel once I had them on. Reward enough for me! What helps you through the long run? All of your tips are things that I use to some extent to help me through my long runs too. This past weekend I actually discovered the idea of listening to podcasts on my long runs. I broke my run into 3 segments (5 miles/5miles/3 miles) and listening to the podcast on the second segment which really helped the time go by which was so nice. I’ve been meaning to try podcasts as well, any recommendations?